While I was researching my trip, I was happy to find out that one of the main areas of producing Spain’s famous jamón was in Guijuelo, a town near Salamanca, and that the jamón factories there give public tours. So I looked one of the tours up, called “Jamonturismo” offered by the Julian Martín factory, and the time of the tour - Saturday 11am to 3pm - happened to fit well with the bus schedule to and from Guijuelo. There was a bus on Saturdays leaving Salamanca at 10am, arriving in Guijuelo at 10:45am. 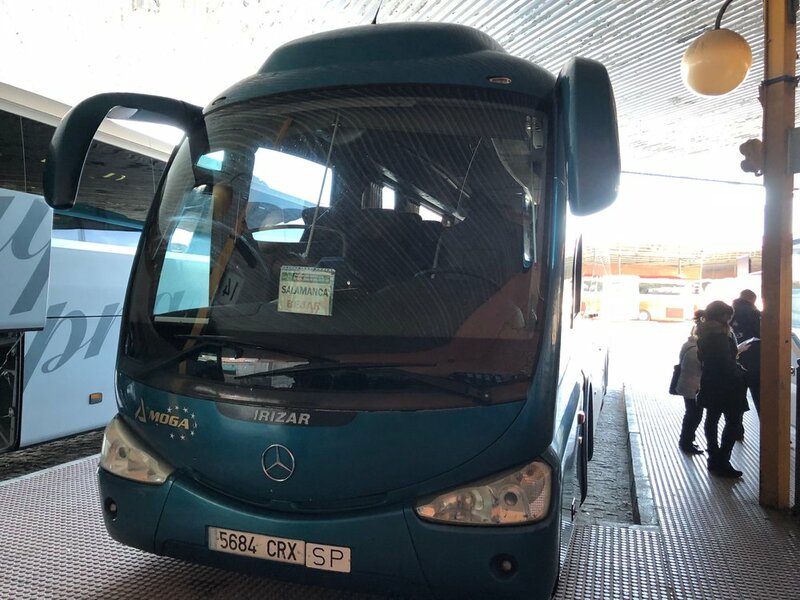 And then the return bus was at 4:05pm arriving in Salamanca 45 minutes later. So Saturday morning, I went over to the Salamanca bus station in the west part of town. They looked like they were going through some renovations, but like just about all bus stations in Spain, the station looked quite run down, like it was built in a different era and never taken care of since then. This is in stark contrast to the generally bright and clean train stations and airports. Look at this timetable board with disappearing numbers! The bus I was to take was the one bound for Bejar. The operator of the bus is called Moga. …and then the billboards advertising jamón started popping up, announcing our arrival into Guijelo. So the meeting point of the Julián Martín tour is at their shop on the outskirts of town, but once everyone on the tour is checked in, you drive over to their main factory which is in a separate place actually closer to town. I was the only one who came by bus so couldn’t drive myself, but the tour guide gave me a ride in his car. The first part of the tour is in the factory that makes sausages, like chorizo. Pictures were not allowed in most parts of the tour, hence the paucity of photos. Also, since it was a holiday weekend, most of the workers were on holiday so we actually didn’t see much action going on. Still, it was interesting to learn that Julián Martín is one of Spain’s top 3 producers of sausages and jamón, and they actually produce for many different labels, including supermarket private label products. Our guide explained that the only difference between one sold under their brand and another brand would be that theirs might be in a natural sausage casing, while the other brand might use plastic, but the meat mixture would be the same. The second part of the tour moved us over to the jamón factory. Here, we visited the salting room, and various rooms of different humidities and temperatures for curing. The final step was curing in a large room with natural ventilation through the space. While on this tour we certainly saw a lot, I didn’t find the process explained so well. 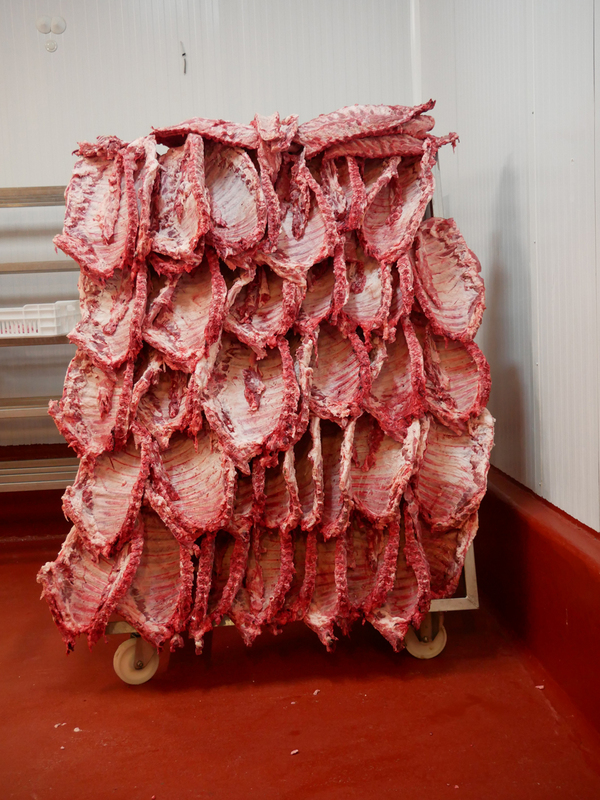 I asked what was the logic around the different rooms being at different humidities and temperatures, and the guide simply said that they dried the meat differently. In contrast, during my food tour in Emilia-Romagna with Italian Days, I learned that the different rooms in the production of prosciutto mirrored the changes in temperature and humidity according to the seasons of the year, so they replicate a natural progression but in a controlled way. Here again though, it was fascinating to learn how many different labels the factory sells to. Not only do they have their own Julián Martín brand, they also produce the ones sold under the El Corte Inglés brand, private labels for Carrefour, and soon Mercadona would be launching a new brand produced by them. The third and final part of the tour was the most exciting: the tasting! For this we went back to the starting point, and were led to a large basement space which seemed to be able to accommodate huge groups. Bottles of water and wine were set out for us, along with baskets of bread and trays of pre-sliced chorizo, lomo, and boneless jamón (formed into a square and sliced). …and then they kept slicing and slicing. Not only was this jamón ibérico, that is, jamón from pigs with at least one Iberian parent, this was jamón ibérico de bellota, or the top grade jamón made from pigs who have only eaten a diet grazing in the plains of 100% acorns. This is some pricey stuff! So we had no choice but to eat and eat and eat. In the end, we were so stuffed, there were uneaten plates of jamón de bellota left over on the table! I know I certainly ate more than enough to justify the 35€ cost of the tour. At the end, we had a chance to go back to the store and buy jamón, of course. There really isn’t much to see in Guijuelo besides the jamón factory. It’s not a particularly pretty town, so after a walk around, I went back to the bus station to just wait for my bus back to Salamanca. While the quality of the explanation on the tour didn’t quite rise to the level of the best tours I’ve been on, I still had a great time, and the “tasting” at the end (more of a gluttonous lunch!) more than made up for any shortcoming.